For these 15-year-old girls and boys, the path to their library can sometimes mean a stormy walk along the beach for it is situated on an island, way up in the north of Germany. We all live on the island of Sylt. Some of us were born here, others came originally from completely different parts of the world. Our parents all work here, and we all go to school here. Depending on where we live, our path always leads directly along the beach, which is, of course, something special. We were all introduced to the library at a very early stage. Even primary school children here are taken on a class outing to the library by their teachers and many of these kids still have the library card they were given on that day. For some, however, their cards just gather dust in a draw somewhere, which is actually a pity. Children up to the age of 18 can take out books free of charge. Schoolgirls using the digital catalogue: free access to knowledge, art and entertainment from all over the world | Photo (detail): © Birgit Dankert It would, of course, be nice if there was an even closer connection or cooperation between the Sylt School Centre and the library, but, on the other hand, the way it is gives the library a lot of freedom. It is this in particular that has turned the library into a regular meeting place, a place where we can study for school and exchange ideas together, because the library has a lot of media that we need for our lessons. This is of particular value to those who want to study later at university, when they will have to deal with academic libraries. The library can provide information about things that interest us personally. We can get away from all the stress and strivings of everyday life. It is also a place for people who want to cut themselves off from the world for a while. In the Sylt library there are quiet, little corners for those who need them. Immersing oneself with audio books and making a hobby out of specialist knowledge | Photo (detail): © Birgit Dankert We find it unnecessary to rank books against other media. We don’t have a problem with that. We know exactly what we want to do about social media and what's going on in the library. Why shouldn’t we read books? It is so good to feel one in your hands, but we ourselves decide what we read and how we read it. The unmistakable sound of turning a page, simulated in an e-book, is cool. 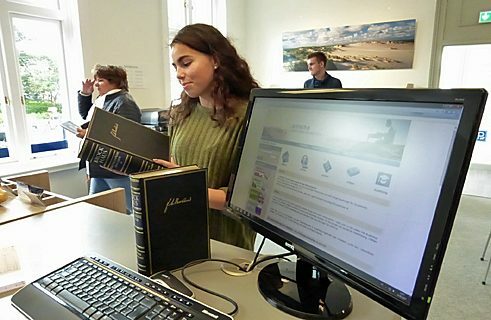 Line at work – on the “Zwischen den Meeren” online program, but the good old dictionary has not been forgotten | Photo (detail): © Birgit Dankert Two of us, Line and Aurelia, are already working a few hours every week in the Sylt library. Having young people in the team goes way back when and has a long tradition, they are called “Bücherkinder” (book children). They have their own app to organise their voluntary work. As “book children” Line and Aurelia are something like “Girl Fridays” - they organise the provision of regional and supraregional daily newspapers, both in print and digital form, and take care of the “Zwischen den Meeren” online lending system, an e-learning program whose name means the land between the Seas, i.e. the North Sea and the Baltic Sea. The eleven young people around the age of 15 attend the two 9th grade classes of the Sylt School Centre in Westerland, a grammar school with Gemeinschaftsschulteil (classes that promote a feeling of community). Sylt Library was thoroughly renovated in 2016 and has over 15,700 media units. Its special form of organisation, involving local, regional and national bodies, as well as public and private bodies, provides public libraries outside the big cities with a professional approach and internationally accepted standards. What is your favorite library? What do you like about your library? Did you have a special library experience? Your story is in demand! The library and information scientist, Prof. Birgit Dankert, is also patron of the Sylt library and regularly visits the island. This time she is talking to eleven young people from the two ninth grade classes at the Sylt School Centre in Westerland. Copyright: Text: Goethe-Institut, Birgit Dankert. This work is licensed under a Creative Commons Attribution – Share Alike 3.0 Germany license. This service allows you to borrow approximately 19000 digital materials, such as eBooks, eAudio books and electronic newspapers by downloading them to your computer or e-reader.